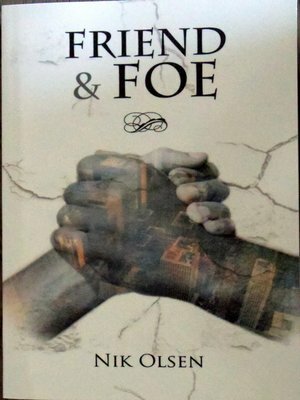 Global conflicts & local injustices are combined to create a plausible disaster scenario involving two men from opposing religious backgrounds who have unknowingly fought against each other for their respective beliefs.Their colourful lives are recounted through flashbacks from a bestial corrective cell in Iran, where they slowly begin to trust each other, and to accept there may be some external force manipulating the outcome of many bizarre assignments.Joe has struggled to support his family from an early age, moving from Lebanon to Chechnya and finally Europe, where they face continual pressure from ideological clerics. Through circumstances he joins the Taliban in Afghanistan, where his prowess is resented and he is given deadly missions.Ben was brought up in a loving family on the West Bank, though he is unaware they are not his natural family. He joins the military academy where he is recognised for his attributes and is soon involved in a mission to save his father who has a senior position in the IDF.The two men's lives are inextricably interwoven through adversity, though seemingly unconnected, with respective family lives in different countries. A powerful organisation with futuristic technology, led by a brilliant polymath, with roots in the Renaissance and beyond, has infiltrated numerous organisations and government posts over decades and is hoping to prevent the self-destruction of the planet. The aims are possibly just, though the means drastic; but is it the best solution for the human race which is degrading the environment at an unsustainable level?Beth & Anna play a big part in the lives of Ben & Joe, where their families and connections bring an intimate touch to their hazardous exploits. The story is pure fiction, though many aspects of the plot are taken from news stories giving a completely believable account of their activities, including the scene where the Iranian purchase of the fastest speedboat in the world was used to hunt them during their escape from the prison across the Persian Gulf.This is the first of three books, with the intention of the third book offering the final twist, and a possible disaster scenario for the world if the powerful organisation isn't successful in removing the existing hierarchy; which is ineffective and incompetent, allowing us to self-destruct.Unique is a word often abused, but the author is unaware of any other novel with a similar theme. The writing may not be perfect for which the author apologises, but the storyline is compelling.